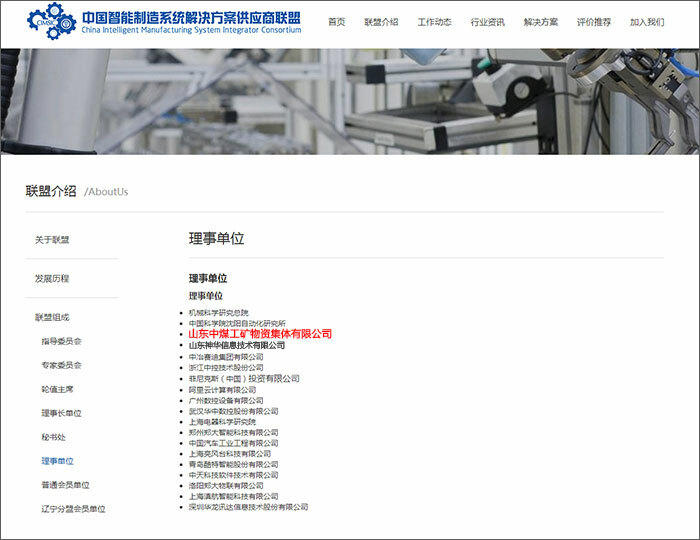 Recently, China Coal Group was successfully selected as the governing unit of China Intelligent Manufacturing System Solution Suppliers Alliance Committee. China Intelligent Manufacturing System Solution Providers Alliance was established on November 30, 2016. The alliance is based on demand and industry chain, fostering and developing smart manufacturing system solution providers, building intelligent manufacturing system integration technology research and development, and industrial application. And the integrated public service platform for marketing promotes the safe and controllable development of intelligent manufacturing equipment and promotes the transformation and upgrading of the manufacturing industry. At present, the world is setting off a new wave of industrial revolution. The transformation of equipment manufacturing industry with intelligence as the core is guiding the fundamental changes in traditional industries and promoting the arrival of a new round of global technological innovation. China Coal Group actively responded to the call of the state and established the China Coal Industry Intelligent Research Institute. Based on years of experience in the industrial field and the use of the most advanced intelligent technology, the company developed advanced intelligent products for China and developed intelligent products for China. Successfully developed a variety of high-end intelligent products such as industrial intelligent robots, restaurant service robots, smart home robots, entertainment robots, fire fighting robots, high-tech drones, 3D printing equipment, intelligent security equipment, etc., helping individuals, enterprises and cities to create more Commercial value, and has been recognized by all walks of life. The successful entry of China Coal Group into the China Intelligent Manufacturing System Solution Providers Alliance will become a new opportunity for the development of the Group. Through this industry platform, we are willing to actively explore high-end manufacturing intelligent manufacturing with the alliance members. Models and best practices make more contributions to the rapid development of smart manufacturing in China!